As the only official remake, what can this film bring to the franchise which we haven’t already seen? When a young woman kills herself, a group of friends contact the local Sheriff but once they start to go missing it seems he isn’t too happy to help them. This film was made in 2003, almost thirty years after the original ,and whereas that film revelled in interesting characters and truly disturbing events, this film uses general horror conventions to create a quick scare. Repeated use of shadows walking in front of the camera is used early on to generate interest, while excessive gore is brought into the fray with a man being hung on a meat hook and a leg being sawn off. Unfortunately, none of this helps create genuine terror but instead the gore results in a good deal of shock and disgust; as a slasher franchise this side of the horror genre is important but a scare should still be placed as equally important which it fails to deliver. The film only picks up interest and pace when Sheriff Hoyt enters the picture as a bullying law enforcer. His enigmatic intentions keep the film entertaining with him constantly shouting abuse at the traumatised group while wrapping a dead body in cellophane wrap and forcing them to put guns in their mouths. However, Hoyt almost disappears as a character when surrounded by the cannibal family, with every character becoming one and the same with no charisma or entertaining dialogue to entertain or create an atmosphere. Making Hoyt a brave lead character throughout would have been a bold move away from the franchises heritage, while also providing this reinvention a strong backbone to build from. 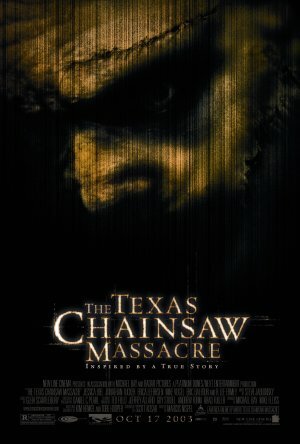 The filmmakers obviously thought Leatherface was enough to peak interest once the group arrives at the cannibal household, but he largely fails to create much of an impression being used more as a tool than a character as he energetically chases after victims with chainsaw in hand. The only interest comes when Leatherface is seen wearing the face of a woman’s long term partner, but whereas these faces have added more to his personality previously, this film fails to recognise him as having a personality. The angry growl face he wears is a perfect example of this using an image instead of a person to convey character. The Texas Chainsaw Massacre unfortunately fails to build on the strong original and the now large back catalogue of films; it weakens these foundations by using stereotypical horror conventions and fails largely to establish truly terrifying horror characters.